Although we plan to go tour the east coast of the USA this year, the year started as they often do for us by participating in the Polar Bear Run in Portland, OR. This year the weather was dry and above freezing. Much of the winter has been like this. We had a very wet end to September but since then we are way below our normal precipitation for the winter. While the east coast has been suffering though the worst cold and snow in remembrance we have been very dry. As of this writing in late January there are four small wildfires burning on the Oregon coast. This in the part of the country known as the "Pacific Northwet". 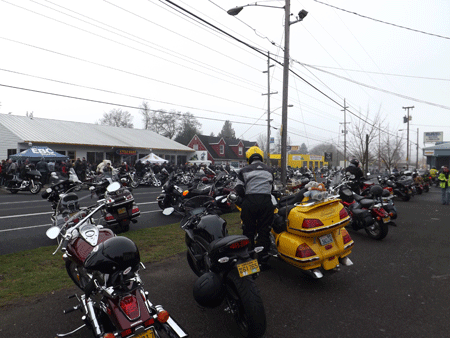 The Polar Bear Run was well attended, as it always is when the weather in January is good for riding. We parked and registered, ate some of their usual chili for our breakfast, and met up with Mark and his wife. 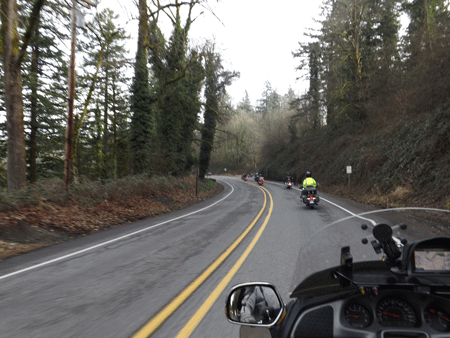 We have ridden with Mark several times (including last year's Cowboy Dinner Tree Campout) but never with his wife. The Polar Bear Run always starts and ends at the same places; Cycle Gear store in Portland & Jimmie O's Pizza in Oregon City. And there are always three routes to get there: The Baby Bear - essentially straight there; The Mama Bear - about 50-60 miles in length; and the Papa Bear - about 110-120 miles in length. We always take the Papa Bear. The run actually took us on some roads we had never been on before. Considering that we have been going on Poker Runs in the Portland area for over 30 years this is no minor achievement. After the run we ate a late lunch at Jimmie O's and headed home. This run has no prizes or awards at the end. It is just a good way to start the year! The 2014 East Coast trip will start by going south to Los Angeles and turning east to get to New Orleans in time for Mardi Gras and then go on to Daytona Beach for Bike Week. After that we will head down to Key West, turn around and follow the weather north, ending with the fall colors in Nova Scotia before turning west and heading home. This is planned to take up to eight months. That will make it our longest single trip. The previous longest was seven months in 2008 in Europe/Africa. The poet Robert Burns said "The best-laid schemes o' mice an 'men Gang aft agley" and those of you who have followed our adventures for the last eight years know that we have had to change plans quickly more than once. (See Planning Part B, Planning Part C and Planning Part D for the problems we had while planning our European adventures.) So keep watching during the upcoming year and find out if we make it. I sure hope we make at least the first half as we have several paid reservations already through Louisiana and Florida. Reservations at the state parks of Louisiana and Florida may be made no earlier than 11 months in advance. At 11 months in advance of Mardi Gras our computer crashed and we ordered and bought a new one. One week later, at ten and three quarter months in advance I got the last campsite in the second state park near New Orleans and the second to last campsite in the only state park near Daytona Beach Bike Week. Only one week into the 11 month reservation period and only one campsite is left! (We like the state parks whenever possible because they do not raise their prices for special events. It is why we stayed at Custer State Park in S. Dakota for Sturgis Bike Week.) We also have reservations at several other parks in Florida because it is the busy season for Florida. Now we just have to get there. Follow along as we leave for New Orleans in mid February; now less than three weeks away. I will be updating this irregularly from the road. Look here for a map of our route.